St James the Apostle, Blessed Mary MacKillop, St Paul the missionary, Catholics in the Middle East today from Egypt to Iran, evangelist and author of the Acts of the Apostles St Luke, St Peter Chanel, Blessed Peter to Rot and the Catholics of Papua New Guinea and the Pacific region – what do they have in common with us? Through our baptism we are called to live as a ‘group of believers united, heart and soul’ with all those who have gone before us. As I think of the lives of these people and the experiences I will have in the next few months as I take a sabbatical, I am reminded that the bond of communion unites us across time and distance. 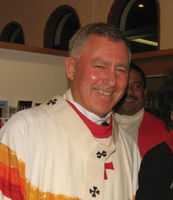 At a meeting in Wellington of the three canonical bodies of the archdiocese – the Archdiocesan Pastoral Council, the Board of Administration and the Council of Priests – on Friday July 23, we reflected on the words from the Acts of the Apostles ‘The whole group of believers was united, heart and soul’. ‘We will remain ‘of one heart and soul’, the theme which we developed at the meeting during prayer, study, reflection and planning for the future. We stressed the Catholic social teaching principle of ‘the common good’ and the need for us all to act as good stewards of the gifts God has given us. I leave New Zealand on August 1 with a group of pilgrims following in the footsteps of St Paul. This visit through Turkey and Greece to the places St Paul visited will bring alive once more that which we celebrated during the Year of St Paul. My own prayer will be in the words of St Paul that ‘the message of Christ, in all its richness, find a home with you’. The St Paul pilgrimage finishes in Oberammagau, where we will attend the Passion Play that is presented every 10 years in this small German village. I am very much looking forward to sharing this experience with our pilgrimage group before we move to Rome for three days. After walking with St Paul and with Jesus on his final journey to the Cross, I leave for a month with St James on the camino to Compostella, Spain. Pilgrims take this medieval route from various points throughout Europe and walk towards the city which claims St James (Santiago) as its apostle. It is a pilgrimage I have wanted to make for many years and hope to walk an average 25 to 30 km a day, until I reach Compostella (about 30 days). It is very much my hope and prayer that the journey is marked by an inner spiritual pilgrimage. In October I will go to Rome to take part in the Synod of Bishops for the Middle East as President of the Federation of Catholic Bishops Conferences of Oceania. I will take the experience of Oceania to the bishops and other representatives of the Catholic Church in the Middle East. The theme of the synod is Communion and Witness, calling of the Christian community in the Middle East to continue the ideal of the Acts of the Apostles, to be a ‘group of believers united, heart and soul’. The synod will address the complex and painful challenges facing Christians in the Middle East: political conflicts and resolution, freedom of religion and conscience, relationships with Jews and Muslims, emigration and immigration. The final call of the synod is one of hope: ‘Do not be afraid, little flock’ (Lk 12:32). I am privileged to be attending the synod on behalf of the bishops of Oceania and people of Oceania, for whom St Peter Chanel and Blessed Peter to Rot are patrons. By then there will also be another Oceania saint. In the middle of the synod, on Sunday, October 17, we will celebrate in Rome the canonisation of Blessed Mary MacKillop. She, too, is a gift we will bring to the Synod for the Middle East – her commitment to a life of ‘communion and witness’, her deep and practical concern for the education of rural and poor children and her vision for a congregation of women living after the example of St Joseph. Warmest congratulations and prayerful good wishes to the congregations, the Sisters of St Joseph of the Sacred Heart and the Sisters of St Joseph of Nazareth. I return to Wellington in mid-October. During my absence, the Vicar-General, Fr Gerard Burns, is invested with authority for the ordinary governance of the archdiocese. All other services will continue as usual. All of you people of the archdiocese will be with me over the next three months. Please pray for me as I will pray for you.